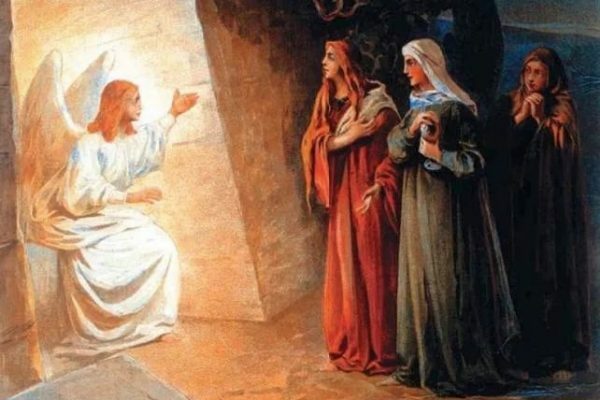 Why Were the Myrrh-Bearing Women the First to Learn the News of Christ’s Resurrection? Every age has certainly had its challenges when it comes to following God and the truth He’s revealed. Today’s culture with its dominant secular ‘religion’ of humanism is no different. Increasingly, our Orthodox beliefs are coming under assault, religious liberties are being challenged in many places. This Sunday of the Myrrh-bearing women would have us draw some lessons from their courage, living in a culture where they faced great dangers for witnessing to their faith in Christ. They didn’t hold back or bow to the pressure to keep silent. 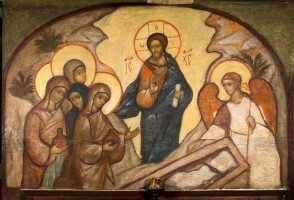 We recall that while the disciples fled, the holy myrrh-bearers were the first to bravely come to Christ’s tomb. Likewise, St. Joseph, also remembered today, boldly asked for Jesus’ body even as St. Peter denied him three times. The Orthodox Faith is the same yesterday, today, and forever, not because it’s a collection of manmade, and therefore, changeable doctrines, but because it’s the timeless truth of relationship, communion with God, as He’s revealed Himself to His Church from the beginning. Those of us living in this age, where the definition of marriage is being twisted, where sin is increasingly defined subjectively and personally, need to remember that the Faith has been “once delivered to the Saints” (Jude 1:3). Being a faithful Orthodox means we don’t change that ‘faith once received’; rather, we become grafted into it—into an ever deeper communion with Christ God. To this end, St. Paul warns us, saying, “Do not be conformed to this world, but be transformed by the renewing of your mind…” (Rom. 12:2) We’re called to be vigilant in not preferring our own ideas, preferences, or that of the rapidly changing norms of our culture, which are constantly being hammered into us, over the timeless truth that Christ is and that He’s entrusted to us in order to experience the fullness of life in Him, find healing, and become inheritors with His Saints of eternal salvation. We’re vigilant so that we can experience that life in Him now and freedom from enslavement to this world with all its passions and twisted thinking. In times of crises in a culture, it’s okay, at first, when feeling conflicted between what the Church teaches and the latest that society preaches, to simply follow what the Church has taught since the beginning, what the bishops and priests proclaim of the timeless truth Christ is. A child, when first learning anything, starts out by following what his parent teaches. Only later does he come to understand that touching fire burns. It’s also okay to ask, “why?” There’s nothing arbitrary in the Orthodox Faith. All that the Church teaches is meant for our good. As we grow in our faith, we learn to love the teachings of the Church not only because the Church says so, but because, through worship, teaching, prayer, and Sacraments, the Truth grows in us through the Spirit of Truth, that is, the Holy Spirit. In other words, the truth becomes ‘owned’ by us—not onerous or burdensome, but intuitive, freely ours, as we grow in love of Christ and one another through obedience to Christ and His Body, the Church. Living in our culture challenges us as Orthodox Christians to such an extent that we may find ourselves ‘unpopular’, labeled politically ‘incorrect,’ narrow-minded, bigoted. The temptation to “fit in,” to compromise the faith, can be great—to begin to think that maybe what the culture is saying in contrast to the truth is, well, somehow okay or ‘reasonable’. We as Orthodox Christians are called by virtue of our baptism to transform the culture, to baptize the culture, not to conform our faith to the culture. This is hard; this increasingly sets us apart, someday, it may even be a risk for imprisonment, but this is also the way of love, the way of witness, the way that preserves the hope of salvation for all—this is the way of courage modeled by the countless Saints before us. Thanks be to God, they, and the Apostles after them, were willing to love to such an extent that they preserved the faith in the face of persecution. What gave the Myrrh-bearing women and the pious Joseph the courage they needed to do what the others would not, could not? Simply put, they were single-minded in their love for Jesus, as we hear in the Holy Scriptures, “Perfect love casts out fear” (I Jn 4,18). They came to Christ even as all others rejected Him, fled from Him, denied Him, in order to keep themselves from being condemned or persecuted. But despite whatever fear they had, their love of Christ, compelled them to come to Jesus, and to go forth proclaiming the Good News of His resurrection—even as others attempted to silence them, even as they were threatened to be cast out of the Temple, even as Christians began to be persecuted and killed for their faith in Christ. 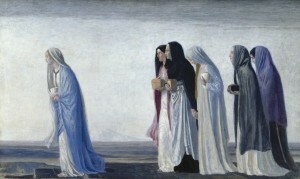 For this reason, we remember them as examples of the strength and courage of humility—models of godly womanhood, but also examples for all of us of godly humanity: we all need such humility and courage if we too are to keep our faith in our own day and follow Christ and be witnesses of His truth—even when it costs us. “Our Lord says, “…Whoever confesses Me before men, him I will also confess before My Father who is in heaven. But whoever denies Me before men, him I will also deny before My Father who is in heaven (Matt. 10: 32-33). You and I are called to a greater love like their love, a love that’s willing to ‘offend,’ when necessary, for the sake of another’s eternal soul, for the sake of the truth that is the only hope of salvation. Our love for Christ enables us to overcome our fears and have the courage to stand up for the truth while also loving those confused by “all the winds of doctrine” swirling around us. We love so that those who sin may find healing as we do and that others can struggle, recover, repent as we do. Such is God’s grace and love for us, but such also is Christ’s calling on us. The question for us is this: Will we be like those who flee, deny, or succumb to the culture out of fear, or will we be humbly courageous like the Myrrh-bearing women and St. Joseph of Arimathea, who loved God more than they feared man. Will we wrestle and come to better understand the Church’s teaching and calling on us? Only in this way, the way of true love and courage, do we learn to love our fellow man and contend for the faith as we are called to, to give hope to the hopeless and bring healing to the sin-sick, and model such healing and repentance in our own lives. Only in this way, do we protect that which is sacred and those who are most vulnerable in our society. We stand for the Truth, representing Christ to a world in such great need of the timeless truth of Christ. The love of God compels us, the love of God animates us, the love of God shows us the way. Holy Myrrh-bearers and St. Joseph, pray for us sinners.